Just around the corner from Piazza Navona is one of the most unique, underrated museums in Rome. 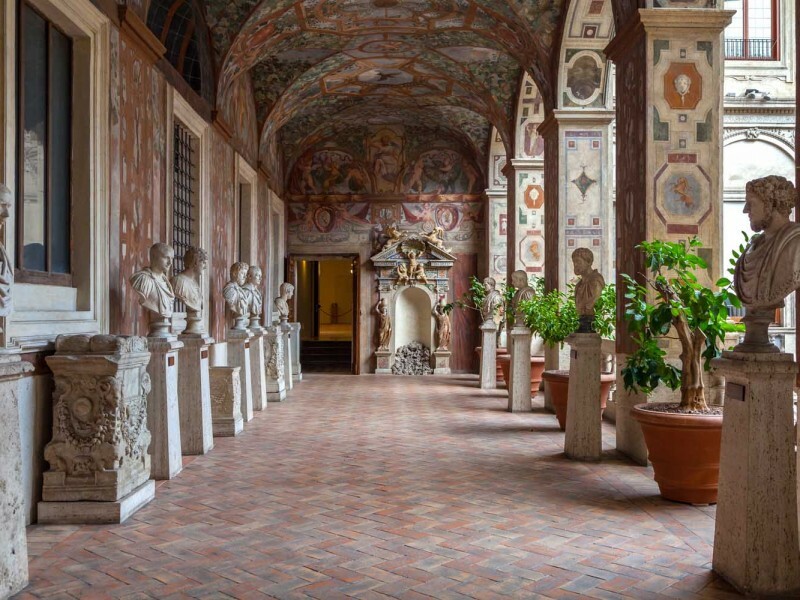 Housed in a frescoed Renaissance palace, the collection of Palazzo Altemps is truly a hidden gem in the heart of Rome, boasting some of the greatest masterpieces of Ancient Greek, Roman and Egyptian art. On this special Rome private tour an expert guide will take you on a journey through 4,000 years of art and history, showing you powerful works such as the Ludovisi Gaul - a statue depicting the suicide of a Gaul as he holds his dying wife - and the intricate Ludovisi Battle Sarcophagus. After a stroll through the famous shopping street Via dei Coronari, you’ll visit the towering Roman mausoleum now known as Castel Sant’Angelo and learn how it was transformed and fortified over the centuries, with some rooms even becoming sumptuous papal apartments. From ancient art to papal luxury, this tour will show you the secret history of the Eternal City, taking you to fascinating places that are often overlooked. Join us on this cultural tour to discover a hidden gem in the very centre of Rome, the beautiful Palazzo Altemps. This elegant 15th-century palace near Piazza Navona was built over the remains of a medieval tower and a Roman villa, and now houses part of the stunning collection of the National Roman Museum. 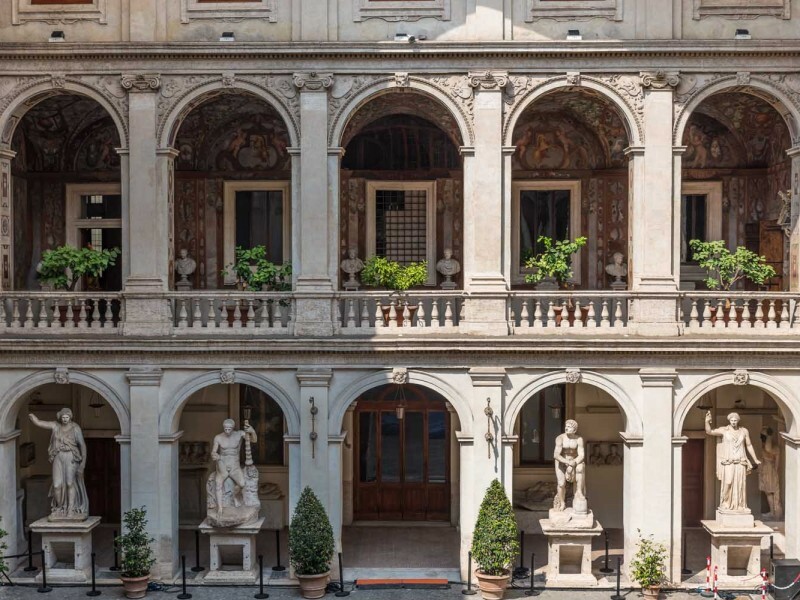 In the company of your personal guide you’ll explore the beautiful courtyard and frescoed rooms of Palazzo Altemps and discover masterpieces of Greek, Roman and Egyptian art, including graceful statues of gods and dramatic battle scenes. A visit to Palazzo Altemps is a journey through 4,000 years of history, religion and mythology, in one of the most beautiful buildings in central Rome. After a stroll through the streets of the centro storico, your tour will continue at Castel Sant’Angelo, an imperial mausoleum that was transformed into a fortress, prison, and even a papal palace. Although it’s one of the most iconic monuments in Rome, many are unaware of the treasures inside. Visiting Castel Sant’Angelo with our expert guide will give you a new perspective on Roman history, and allow you to discover some of the most spectacular rooms - and views - in the Eternal City. Palazzo Altemps was built in 1480, incorporating pre-existing medieval houses and expanding over time. In 1568 it was bought by Cardinal Altemps, who transformed the courtyard into the beautiful space we see today, and used the rooms of the palace to display his impressive collection of ancient statues. Cardinal Altemps had a son with his mistress, Roberto Altemps, who would have inherited the palace if he had not been executed by Pope Sixtus V for adultery. As you explore the beautiful rooms of Palazzo Altemps you’ll gain a fascinating insight into the society and scandals of the 16th century, while admiring one of the greatest art collections in Rome. 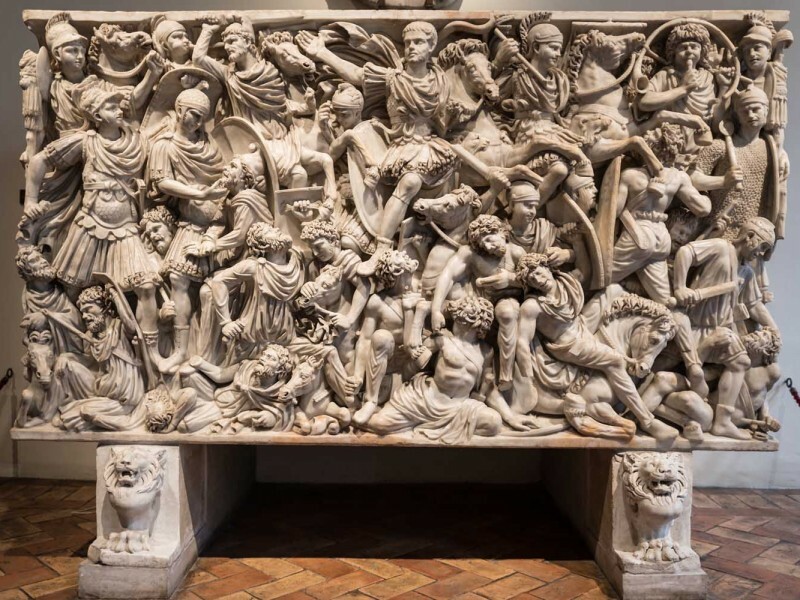 The undisputed masterpiece of the museum’s collection is the Ludovisi Battle Sarcophagus, a striking Roman sarcophagus from the 3rd century depicting Romans fighting Barbarians. In these dramatic, highly emotive battle scenes the triumphant Roman soldiers seem to burst from the marble; some Barbarians fight back, while others wearily submit to defeat. In the midst of the chaos is a Roman on horseback, whose serene expression and ambiguous gesture contrasts with the violence surrounding him. This young Roman represents the deceased, and is believed by some to be a representation of Hostilian, the son of the emperor Decius, as your tour guide will explain, helping you to appreciate the intricate details and nuances of this masterpiece. Many of the sculptures in Palazzo Altemps were discovered in the grounds of the Villa Ludovisi, a garden that was once the site of the Gardens of Sallust, some of the most luxurious gardens in Ancient Rome. These gardens later belonged to Julius Caesar, which may explain the presence of the Ludovisi Gaul, a powerful statue that celebrates the defeat of the Gauls while acknowledging their ferocity and courage. In this 2nd century statue a muscular Gaul stabs himself in the neck while supporting his dying wife, who falls to the ground beside him. In striking contrast to the violence of these scenes is the beautiful Ludovisi Throne, an elegant and mysterious work of art from 460 BC. The exact purpose of the artwork is unknown, but the scene on the main panel is believed to represent the birth of Venus as she rises out of the sea, attended by two young women, while the women on the side panels could represent Sacred and Profane Love. Whatever the intentions of the artist, it remains one of the most beautiful ancient artworks, carved out of white marble that seems to shimmer and glow in the sunlight. On your unique Rome tour of Palazzo Altemps you’ll also see some magnificent statues of gods and mythological characters, including an enormous Head of Aphrodite that may have once been the cult statue in the Temple of Venus Erycina in Rome. Once a year the prostitutes of Ancient Rome would take part in a procession, making offerings to the goddess in the hope of being blessed with a good year of business. A walk through the galleries offers a unique insight into the beliefs and rituals of the Ancient Romans, as you admire an unusual red marble bas-relief of a Follower of Dionysus, an impressive statue of Dionysus from the Baths of Constantine, and a famous Roman copy of the Aphrodite of Cnidos. 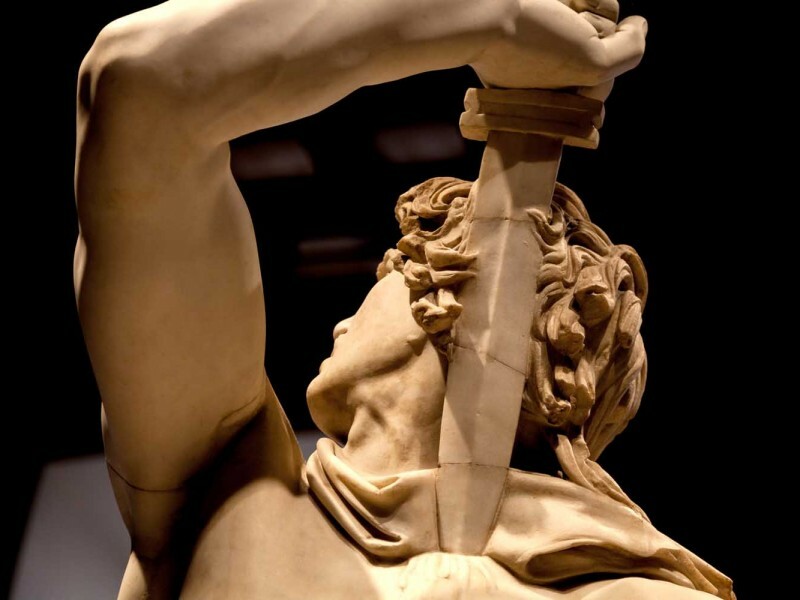 Some of these statues, such as the imposing sculpture of Ares from the 1st century BC, were restored by talented artists in the 16th century, including the young Bernini. As you explore Palazzo Altemps your personal guide will draw your attention to the fascinating stories behind these beautiful artworks. You will learn how they were unearthed and restored, and learn about the momentous events these artworks portray - stories of gods and heroes - appreciating their vivid narratives and exquisite style. You’ll also discover another side of Roman religion, learning about the worship of the Egyptian gods that was once concentrated in the Pantheon area, in the temple of Isis and Serapis. The Egyptian findings displayed in Palazzo Altemps include evocative statues of gods, priests and pharaohs, the oldest of which dates back to 1800 BC. After your visit to Palazzo Altemps you’ll enjoy a walk through some of the characteristic streets surrounding Piazza Navona. Via dei Coronari is one of the most famous streets in Rome, renowned for its beauty and its eclectic range of shops. Grand Renaissance palazzi stand next to antique shops, gelaterie, and shrines to the Virgin Mary. You’ll also see the beautiful Church of Santa Maria della Pace, and Chiostro del Bramante - two splendid examples of Renaissance and Baroque architecture. Chiostro del Bramante is mainly used as an innovative exhibition space, hosting some of the most important art exhibitions in Rome. We’ll pause for a drink in the elegant cafe before continuing our tour of Rome. To reach Castel Sant’Angelo, we’ll cross the breathtakingly beautiful Ponte Sant’Angelo, which is lined with marble angels sculpted by some of Rome’s greatest artists, including Bernini. As you admire the view of Castel Sant’Angelo and the river Tiber, you’ll learn about the rich history of this remarkable bridge. Originally built in the 2nd century by the emperor Hadrian, it became an important part of the pilgrim route in the Middle Ages, and was later used to display the corpses of prisoners who had been executed nearby. On your Castel Sant’Angelo tour you’ll have the opportunity to explore this magnificent monument in-depth, from richly decorated Renaissance rooms to its spectacular rooftop terrace. Although many visitors walk past Castel Sant’Angelo on their way to the Vatican, the castle’s secrets are discovered only by the few who venture inside. Castel Sant’Angelo has transformed many times across the centuries. When it was first built in the 2nd century, designed as a mausoleum for the emperor Hadrian and his family, it was the tallest building in the city. It was later used as a fortress, military base, prison, and papal apartment. You’ll enter Castel Sant’Angelo through its ancient heart - the mausoleum at the base of the building - before winding up through layers of history. As you explore the labyrinthine rooms of Castel Sant’Angelo, your guide will tell you stories of the dramatic events that took place here, such as the Sack of Rome in 1527. Soldiers included Benvenuto Cellini - better known as an artist and sculptor - who wrote a thrilling account of the battle in his autobiography. Although it may be hard to believe from the castle’s austere exterior, Castel Sant’Angelo contains some of the most beautiful rooms in Rome. You’ll be amazed by the opulence of the papal apartments, vividly decorated with frescoes, and by the stories of the popes’ luxurious lifestyles. 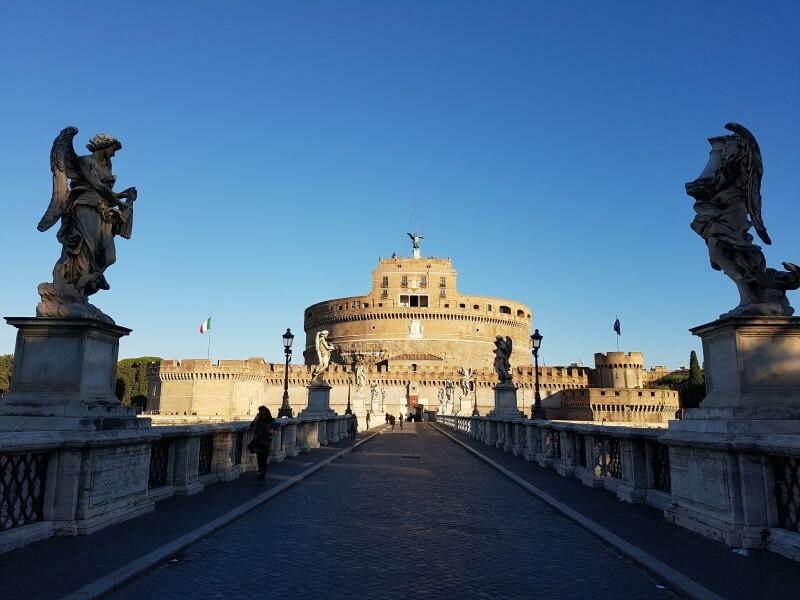 Your guide will also explain how Castel Sant’Angelo played an important role in times of trouble, due to a secret passageway connected to the Vatican that enabled the pope to flee to safety. Your tour ends at the top of the Castel Sant’Angelo, where you’ll admire spectacular panoramic views of all Rome, the Vatican, the Tiber river and beyond. You’ll also learn the story of the angel of castle - one of Rome’s most intriguing legends. Discover millennia of history and beauty in Palazzo Altemps and Castel Sant’Angelo, for an unforgettable experience of the Eternal City. Frederica was a great guide. She was very knowledgeable and passionate. We enjoyed our time with her.